Today’s piece is a devotional necklace. 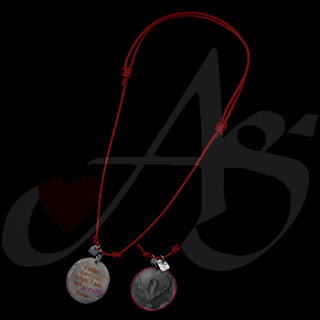 This necklace is made from red leather chording with a nickel medallion. On the medallion is the image of St. Joan of arc. On the reverse side are the words, “Pray for me when I am not strong.” A border is hand drawn around the medallion with red metal ink. This piece is no longer available, however we can specially make one just for you! If you would like a similar piece, or any unique piece of jewelry; contact us! Don’t forget to stop by our Facebook page, Google+ page, Twitter, Pinterest, or our website for more special devotional art wear. 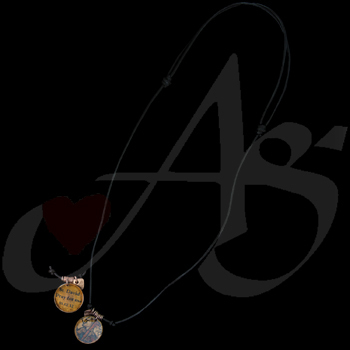 This piece is another specialty Confirmation necklace. It is devoted to St. Sebastian, the first Martyr. The coin medallion is made from nickel sheet metal, and the images are laid using our reverse transfer system. The medallion is attached to brown rough leather using nickel wire. This piece is no longer available, however we will gladly custom make another just for you! If you are interested in a similar piece, or any unique piece of our jewelry; contact us! Don’t forget to stop by our Facebook page, Google+ page, Twitter, Pinterest, or our website for more creative devotional pieces of jewelry! Today’s piece is a devotional necklace. This necklace was made for e Confirmation. On one side are the words, “St. joseph, pray for me” and the other side has an image of Joseph with the baby Jesus. This piece is strung on black cording and closed with adjustable knots. This piece is not available, however we can specially design one for you! If you would like this piece, a similar piece, or any unique piece of jewelry; contact us! Don’t forget to stop by our Facebook page, Google+ page, Twitter, Pinterest, or our website for more unique devotional jewelry! Today’s piece is a confirmation necklace. This necklace is strung with black leather, with a brass coin medallion. On one side of the medallion is St. David of Wales, and on the reverse are the words: “St. David, pray for me.” This piece is not available, however we can specially make a different one for you! If you would like this piece, a similar piece, or any unique piece of jewelry; contact us! Don’t forget to stop by our Facebook page, Google+ page, Twitter, Pinterest, or our website for more wonderful pieces of devotional artware! Today’s piece is a rosary. 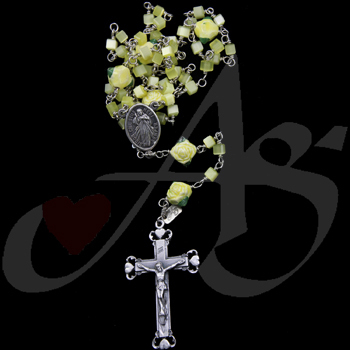 This rosary is made with yellow fiberglass beads and rose-shaped beads with the Our Fathers. The centerpiece is of the Divine Mercy. The crucifix is made of base metal, with a heart on each end of the sides. The entire rosary is made with nickel wire using our unbreakable technology. This piece is not available. If you would like this piece, a similar piece, or any unique piece of jewelry; contact us! Don’t forget to stop by our Facebook page, Google+ page, Twitter, Pinterest, or our website for more unique pieces of jewelry. Today’s piece is a pair of cufflinks. 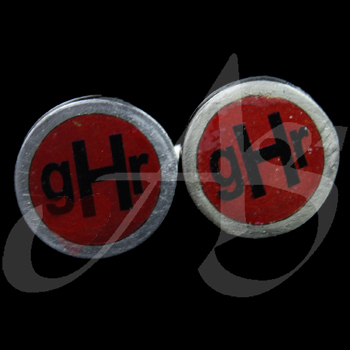 These cufflinks were specially designed and have a monogram on them. The base metal is nickel with red dye for the center and the initials were used using our reverse transfer methods. This piece is not available. If you would like a similar piece, or any unique piece of jewelry; contact us! Don’t forget to stop by our Facebook page, Google+ page, Twitter, Pinterest, or our website for more personalized pieces of jewelry. Today’s piece is a pair of cufflinks. These cufflinks are made with nickel sheet metal. The image of Our Lady is transferred on the metal. This piece is currently available! If you would like this piece, a similar piece, or any unique piece of jewelry; contact us! Don’t forget to stop by our Facebook page, Google+ page, Twitter, Pinterest, or our website for more wonderful pieces of jewelry. Today’s piece is another pair of Agape Gift “Smartlinks”. These cufflinks are specially designed so that they work with ANY cuffed shirt. 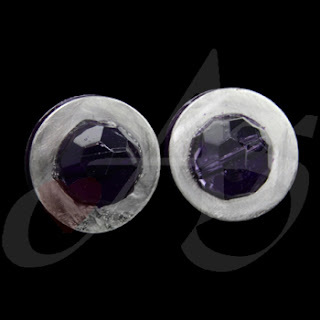 This piece is made of nickel sheet metal, with purple polymer clay between the metal layers, and a half-round faceted Chinese crystal set in the center of the cufflinks. Nicholas says, “these are mine, you can’t have them”; however if you would like a similar pair, we will make you one. If you would like a similar piece, or any unique piece of jewelry; contact us! Don’t forget to stop by our Facebook page, Google+ page, Twitter, Pinterest, or our website for more stunning pieces of jewelry. Today’s piece is a pair of cufflinks. 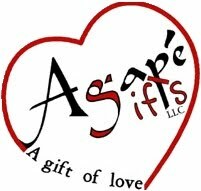 These cufflinks do not have the usual bar clasp, but are a pair of Agape Gifts’ specialty “smartlinks”, which have the ability to accessorize any long sleeve shirt. 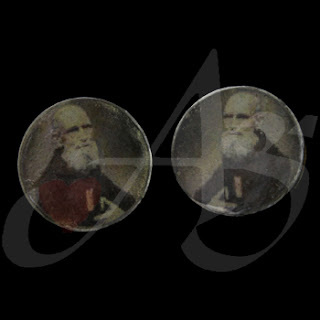 The base for this piece is nickel sheet metal with the image of St. Padre Pio transferred onto the nickel. This piece is currently available. If you would like this piece, a similar piece, or any unique piece of jewelry; contact us! Don’t forget to stop by our Facebook page, Google+ page, Twitter, Pinterest, or our website for more wonderful pieces of devotional art wear. Today’s piece is a rosary. 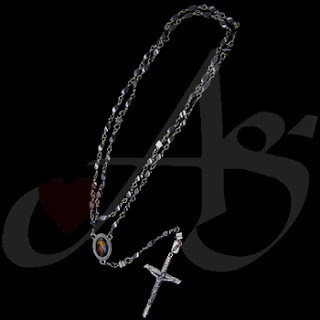 This rosary is made from Venetian lamp glass beads and nickel wire. 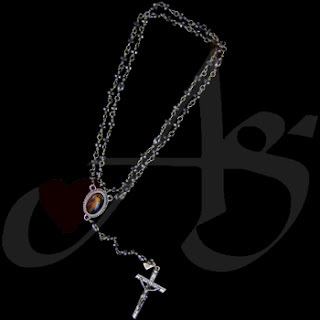 This rosary will definitely add a little style to your prayer. The links are made with our unbreakable technology, so you never have to be afraid of your rosary breaking again. This piece is not available, however we can specially design one just for you! If you would like a similar piece, or any unique piece of jewelry; contact us! 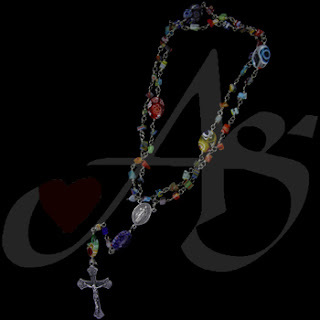 Don’t forget to stop by our Facebook page, Google+ page, Twitter, Pinterest, or our website for more beautiful rosaries. Today’s piece is another ‘manly’ rosary. These beads are ‘twisted’ hematite beads for the Hail Mary’s, and square wire rapped Beads for the Our Father’s. The wire used here is stainless steel, an each of the beads are wrapped using our unbreakable technology. This piece is no longer available, however we can special design on just for you! If you would like a similar piece, or any unique piece of jewelry; contact us! Don’t forget to stop by our Facebook page, Google+ page, Twitter, Pinterest, or our website for more unique Catholic Sacramental jewelry. Today’s piece is a ‘manly’ rosary. This piece is made with hematite octagon bricks and round balls. The wire used is stainless steel. This rosary is constructed with Agape Gifts’ unbreakable technology, so this rosary is durable, and fully functional wherever you are. 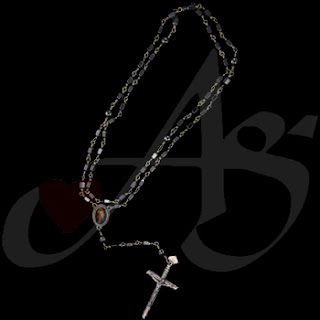 This rosary also has some weight, unlike many of our other crystal or semi-precious stone Rosaries. This piece is no longer available, however we will gladly make on just for you! If you would like a similar piece, or any unique piece of jewelry; contact us! Don’t forget to stop by our Facebook page, Google+ page, Twitter, Pinterest, or our website for more durable pieces of sacramental-wear. This piece is a ‘manly rosary’. 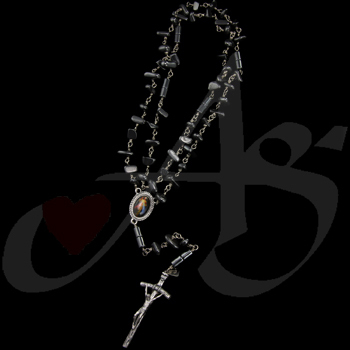 This rosary is made with stainless steel wire, large, chunky, hematite beads, and has an excessive weight of three pounds… for those people who want “heavy artillery”. This piece is not currently available, however we can specially design on for the person you have in mind! If you would like a similar piece, or any unique piece of jewelry; contact us! Don’t forget to stop by our Facebook page, Google+ page, Twitter, Pinterest, or our website for more unique sacramentals! Today’s piece is another First Communion Rosary bracelet. This piece is made with purple agate on nickel wire. The center Our Father bead is made from nickel sheet wire with the image of a chalice and grapes on one side, and the name and date of the first communicant on the other. The remaining two Our Father beads are made with white fiberglass beads. The nickel wire attaching the beads is made with the same unbreakable technology used in our Rosaries. This piece is no longer available. If you would like this piece, a similar piece, or any unique piece of jewelry; contact us! 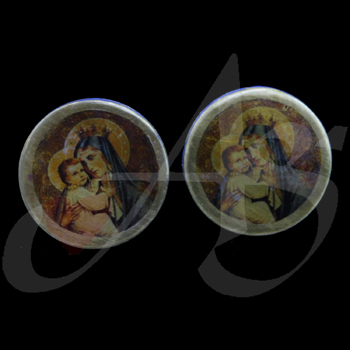 Don’t forget to stop by our Facebook page, Google+ page, Twitter, or our website for more sacramental pieces of jewelry! 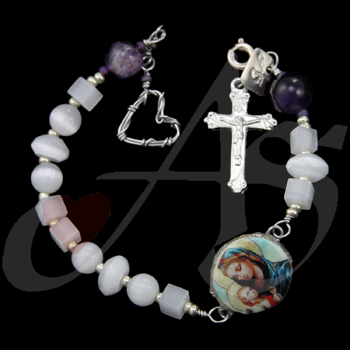 Today’s piece is another First Communion Rosary Bracelet. 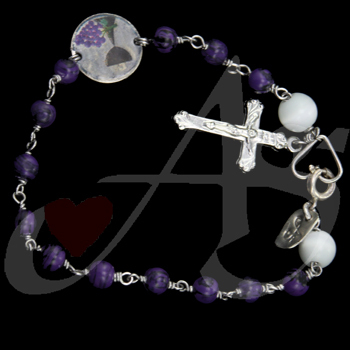 This bracelet is made with white fiberglass cats-eye beads and amethyst Our Father beads. 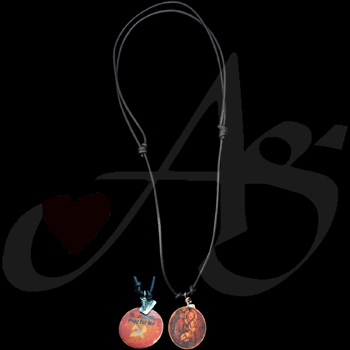 The image on the middle Our Father bead is of Our Lady of the Streets. On the reverse side, it has an image of chalice and grapes. This piece is no longer available. If you would like a similar piece, or any unique piece of jewelry; contact us! Don’t forget to stop by our Facebook page, Google+ page, Twitter, or our website for more uniquely designed pieces of jewelry art-ware. Today’s piece is a tie tack. This tie tack was designed especially for a first communicant. This piece is made with a brass base, and polymer clay. 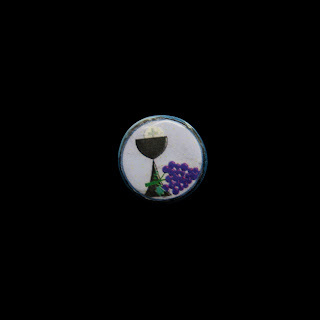 The image of a chalice and grapes was inserted into the clay, then shellacked on. This piece is no longer available. If you would like a similar piece, or any unique piece of jewelry; contact us! Don’t forget to stop by our Facebook page, Google+ page, Twitter, or our website for more splendid pieces of jewelry!